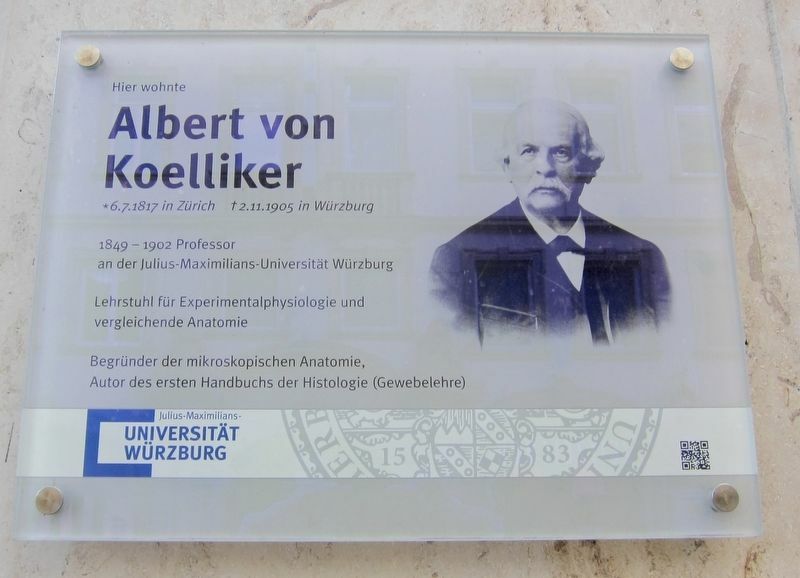 (English translation:) Here lived Albert von Koelliker (born July 6, 1817 in Zurich, died November 3, 1905 in Wuerzburg). Professor at the Julius-Maximilians University, Wuerzburg, 1849-1902. Chair of Experimental Physiology and Comparative Anatomy. Founder of microscopic anatomy, author of the first handbook of histology. Location. 49° 47.841′ N, 9° 56.028′ E. Marker is in Würzburg, Bavaria. Marker is on Theaterstraße, on the left when traveling south. Touch for map. Marker is at or near this postal address: Theaterstraße 1, Würzburg, Bavaria 97070, Germany. Touch for directions. 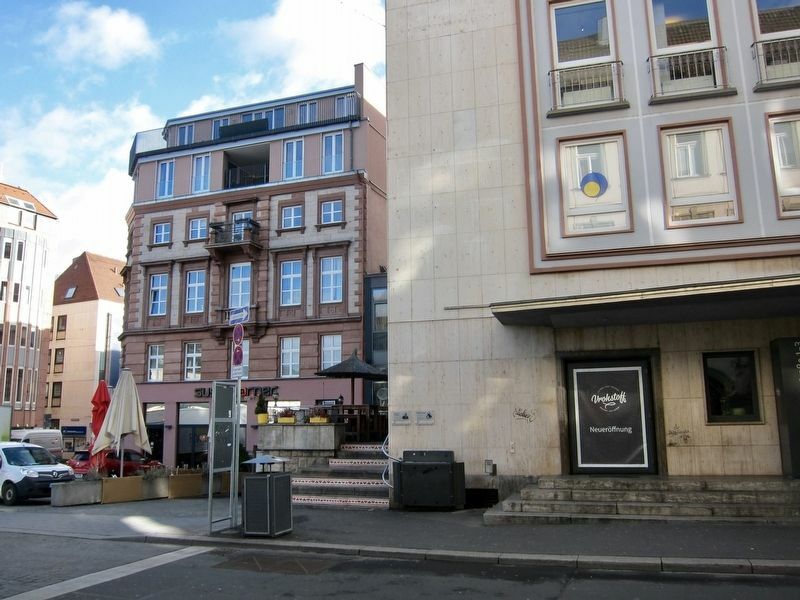 The marker is visible here on the corner of the building, just to the left of the marker for Rudolf Virchow. (a few steps from this marker); Friedrich Daniel von Recklinghausen (a few steps from this marker); Julius von Sachs (a few steps from this marker); Franz Oberthür (within shouting distance of this marker); Carl Caspar von Siebold (about 120 meters away, measured in a direct line); Karl Landsteiner (about 150 meters away); Historicher Gedenkpunkt / A Place for Historical Contemplation (about 180 meters away). Touch for a list and map of all markers in Würzburg. More. Search the internet for Albert von Koelliker. Credits. This page was last revised on April 9, 2019. This page originally submitted on April 9, 2019, by Andrew Ruppenstein of Sacramento, California. This page has been viewed 35 times since then. Photos: 1, 2. submitted on April 9, 2019, by Andrew Ruppenstein of Sacramento, California.